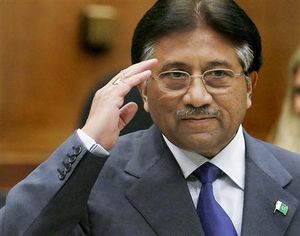 Pervez Musharraf (b. Delhi on August 11, 1943) became President of Pakistan, via a coup on October 12, 1999. He is considered a key ally of the United States in the fight against global terrorism. Musharraf began his military career in 1964. He was promoted to the rank of General on 7th October 1998 and appointed Chief of Army Staff. He was given the additional charge of Chairman Joint Chiefs of Staff Committee on 9th April 1999 which he relinquished in October 2001. He performed his duties as the Chief Executive of Pakistan from 12 th October 1999 to the time he became President. He is now the COAS and the President of the Islamic Republic of Pakistan. After this coup Musharraf fleed into Dubai. In 2013 he returned into his country and started an comeback in the policy, by he wanted to be a candidate in the next election. Later he was arrested by the police. Musharraf is married to Begum Sehba. They have two children, Ayla and Bilal, and both are married. They have two granddaughters from Ayla; a grandson and a granddaughter from Bilal. This page was last modified on 9 April 2019, at 14:10.